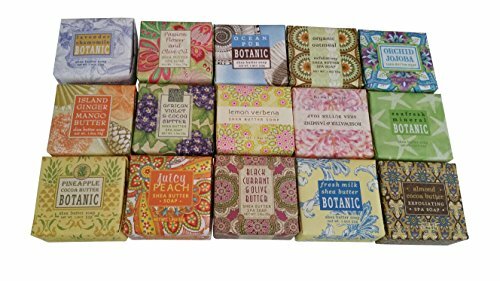 BOTANICAL SOAPS French-milled, luxurious vegetable soaps enriched with shea butter, essential oils and natural extracts in captivating botanical scents. Paper-wrapped and offered in a 1.9oz mini soap square. This sampler consists of one 1.9 ounce bar of each of the following fragrances! BLACK CURRANT and OLIVE BUTTER enriched with shea butter, black currant butter and olive butter JUICY PEACH SHEA BUTTER enriched with shea butter and cocoa butter OCEAN PÜR enriched with shea butter, cocoa butter and natural sea kelp PASSION FLOWER AND OLIVE OIL enriched with shea butter, cocoa butter and virgin olive oil SEAFRESH MINERAL enriched with shea butter, cocoa butter and ocean minerals AFRICAN VIOLET and COCOA BUTTER enriched with shea butter and cocoa butter FRESH MILK SHEA BUTTER enriched with creamy buttermilk and shea butter LAVENDER CHAMOMILE enriched with shea butter, cocoa butter and essential oils of lavender and chamomile ORCHID JOJOBA enriched with shea butter, cocoa butter and jojoba oil PINEAPPLE COCOA BUTTER enriched with shea butter and cocoa butter ALMOND COCOA BUTTER enriched with shea butter, cocoa butter and almond oil and blended with exfoliating cocoa bean shell ISLAND GINGER MANGO BUTTER enriched with shea butter and mango butter and blended with exfoliating wheat bran and cocoa bean shell LEMON VERBENA enriched with shea butter, cocoa butter and lemon extracts ORGANIC OATMEAL enriched with shea butter and cocoa butter and blended with exfoliating organic oatmeal ROSEWATER JASMINE enriched with shea butter, cocoa butter and jasmine oil.